NIA CHARLESTOWN NEVIS (April 22, 2013) — United States Ambassador to Barbados and the Eastern Caribbean His Excellency Larry L. Palmer reminded Nevisians that the evil of child abuse was not unique to any country and knew no boundary. 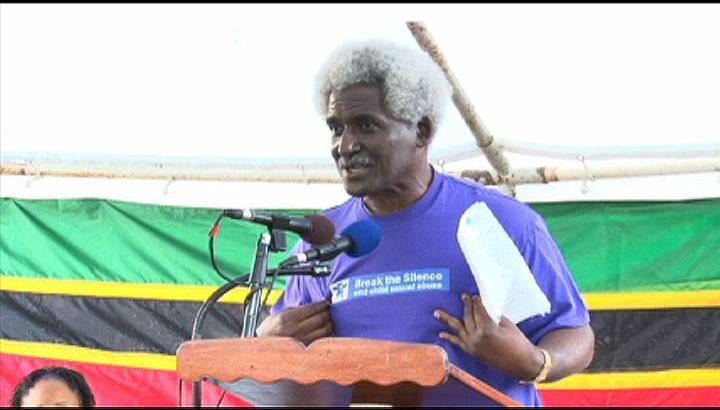 His comment came when he delivered an address at the launch of A Child Abuse and Gender-Based Violence Rally on April 17, 2013 at the Memorial Square in Charlestown. The event, which will be conducted in other parts of the Caribbean, was hosted by the United States Embassy to Bridgetown and the Eastern Caribbean, the United Nations Children Fund (UNICEF) and the Caribbean Women’s Association (CARIWA) in collaboration with the Ministry of Social Development, Gender Affairs Division in the Nevis Island Administration (NIA). “The evil that is child abuse is not unique to one country. It is not unique to Nevis, St. Kitts, the Eastern Caribbean; it’s not unique to anywhere. It is present in my country; it is present in every country around the world. Using the United States as an example I can tell you, child abuse occurs at every socio-economic level, across ethnic lines, across cultural lines, within all regions and at all levels of education. So when someone tells you it’s cultural, you tell them no, it’s criminal,” he said. According to the Ambassador, about 80 percent of children who died from abuse were under the age of four; 30 percent of abused and neglected children would later abuse their own children while 60 percent were likely to be arrested as juveniles; 28 percent were more likely to be arrested as adults and 30 percent were more likely to commit a violent crime. He stated that more than 90 percent of juvenile sexual abuse victims knew who their abusers in some way but it was just a matter of getting those victims to make known who the criminals were and that was the reason the Embassy had teamed up with UNICEF and CARIWA to address the issue through a combined effort and the assistance of the public to help break the silence. 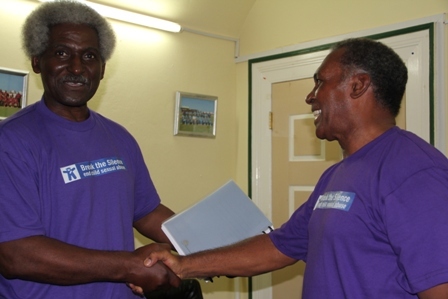 Ambassador Palmer who was a husband, father and grandfather said it was his duty as a man to protect his children from any type of harm – physical, sexual or emotional and called on men in the wider community to do the same. “Children are a gift from God and they are our future. A good father, a good stepfather a good grandfather protects children he does not abuse them. He does not permit anyone else to abuse them. He protects, respects them and cherishes them. He listens to them and he helps them through the good days and the bad and he lets them know he is always there for them. “Men, and I am speaking directly to every man within the sound of my voice, I beseech you, I beseech you to be a real man; don’t be half a man, don’t be a virtual man; don’t be a jive man; don’t be a criminal man; be a real man and do not abuse children. We should cherish them as a gift that God has brought to us; we should help our children our wonderful boys and girls; we should help them to live free from fear. We look to your community, your neighbours, your friends, look to everyone here today and help each other break the silence,” he said. To children he said abuse was a secret that should not be kept and they needed to break the silence. He urged them to not permit persons to touch them in ways that made them uncomfortable, that they should seek help from friends, parents, teachers and neighbours. He also told them they should be good friends as well and if they know of another child who needed them they should not keep that secret but instead break the silence.